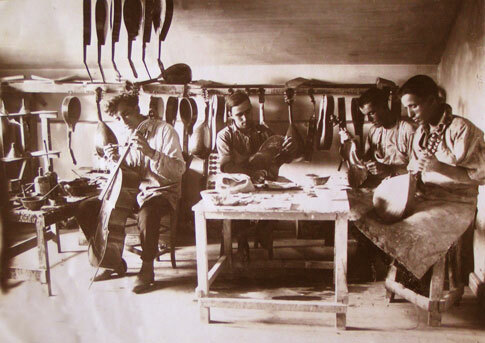 The Bulgarian Luthiers Association was founded in 1999 in Kazanlak, a town with traditions in the art of violinmaking since the beginning of the 20th century. The Association was created to serve the interests of all craft makers producing string instruments. The goal of the association is to continue and preserve the traditions of violinmaking. Its members are craftsmen making violins, violas, cellos, double basses, guitars, bows and accessories. Every professional luthier can become a member of it. Greater interest in the string musical instruments in the begining of the 20th century provoked the real development of the Bulgarian violin art. The instruments - violins, violas, cellos created during that period are strongly influenced by the Tyrol and Bohemian school. The art of violin and guitar building in Bulgaria has become more popular. Today the young makers follow the Italian school tradition, specifically the Cremona school. Currently there are more than 40 master workshops building professional string instruments.